It seems that we often have our own assumptions about the way life is, not just for ourselves, but for others too. When I was driving by the Peace Arch City school maze I noticed a canine visitor to the Family Service Center. This scene put into motion a whole series of questions centered around this pooch seeking psychological puppy love from the Center staff. I wondered if possibly he was left out in the cold at home too. 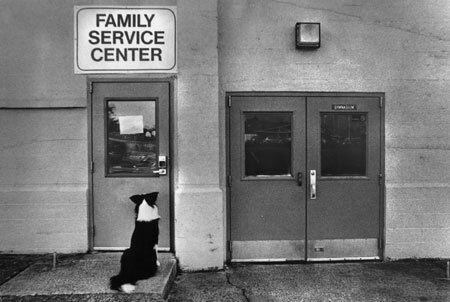 I pondered why he wasn't invited inside to hound the staff to receive the "bare bones"
treatment or obedience training to get ahead in this "dog eat dog"
On the other paw, it could be that this lonely looking hound was merely the canine companion for his human handlers, who themselves needed the services of the family oriented Center staff. It makes a pup's head tilt and ears sag just to be left outside and alone on any front porch. We can only hope that help is on the way for everyone concerned. We want this furred fella to be wagging his white tipped tail all the way home with the hope and expectation of a favorable treatment program for his family and hopefully flavorful treats for all the kids and especially man's best friend.